(Left to right) Sol Yu, Lin Sheng, Zhu Yogang, Kevan Lawlor and Bob Frayer. ANN ARBOR, Mich. and SHANGHAI — NSF International, a global organization with more than 70 years of independent product testing and certification expertise, including products in the automotive supply chain, is working with Ping An Property & Casualty Insurance Company of China, Ltd. to offer its NSF Aftermarket Automotive Parts Certification program to test and certify automotive aftermarket parts in China. The program will meet the needs of the China automotive market around high quality manufacturers, parts, distributors and repair shops. The program was announced in Shanghai, China on July 7 at a joint press conference at held at the NSF Shanghai Co. Ltd. office. 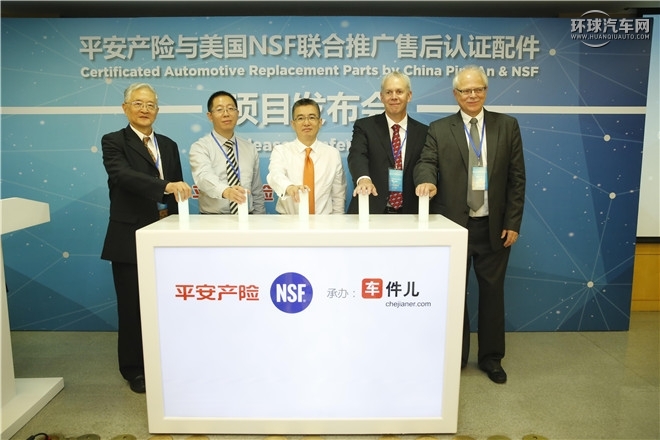 NSF International and Ping An will work together to ensure that aftermarket automotive parts are equivalent to the original equipment (OE) service parts in form, fit and function. The program will start with collision parts such as bumper covers, hoods, fenders, bumpers and hard parts such as sensors, brake components and hydraulic systems and expand to cover additional part types as needs of the market increase. In addition to determining OE service part equivalency, the approval process also will include part testing on vehicle to verify proper fit and verification that the manufacturer meets all in-plant quality control requirements including passing an in-plant audit and ongoing audits. By 2017, the average age of cars in China is expected to increase from 3 years to 4.5 years, which is expected to result in an increasing number of out-of-warranty vehicles and further drive demand for aftermarket products and services. “We look forward to working with Ping An to ensure high-quality aftermarket automotive parts and services are available in China,” said Bob Frayer, Global Managing Director, NSF International Automotive Certification Programs. NSF is a leading certifier of aftermarket automotive parts in both the U.S. and Australia and the only independent third-party certifier of parts distributors and repair shops. NSF International has served clients in China for many years and opened an office in Shanghai in 2005 when NSF established a joint venture with the Shanghai Audit Centre of Quality Systems (SAC) called NSF Shanghai Co. Ltd. This joint venture is approved by the Certification and Accreditation Administration of the People’s Republic of China (CNCA). In 2011, NSF opened the NSF International Testing Laboratory in Shanghai, which works in harmony with the joint venture to provide necessary testing. The NSF Shanghai lab earned ISO/IEC 17025 accreditation from the China National Accreditation Service (CNAS). Companies seeking information about NSF International’s automotive programs can visit nsfautomotive.com or contact Bob Frayer at +1 734-827-6825 or autocert@nsf.org.